Microsoft has defended its business conduct. Will the EU Microsoft ruling benefit computer users? BRUSSELS, Belgium (CNN) -- The European Union has found Microsoft guilty of abusing the "near-monopoly" of its Windows PC operating system and fined it a record 497 million euros ($613 million). The U.S.-based software giant has two months to review the lengthy decision and has said it will appeal. The European Commission issued the unanimous decision Wednesday after a five-year investigation, finding Microsoft in violation of EU competition law. The EU's antitrust authority said "because the illegal behavior is still ongoing," it would also demand changes in the way the U.S. software giant operated. It gave Microsoft 90 days to make available a European version of its Windows operating system to PC makers without a media player. Microsoft was also given 120 days to give programming codes to rivals in the server market, so their products can have "full interoperability" with desktop computers running Windows. "Dominant companies have a special responsibility to ensure that the way they do business doesn't prevent competition ... and does not harm consumers and innovation," EU Competition Commissioner Mario Monti said. "Today's decision restores the conditions for fair competition in the markets concerned and establishes clear principles for the future conduct of a company with such a strong dominant position." CNN correspondent Jim Boulden said the remedy only applies to Microsoft's business in Europe, though the EU could have ordered Microsoft to change its business worldwide. It could take up to a year for Microsoft's appeal to be filed and it is not clear if the EU court will order the company to change its operating systems during the appeal process, which could last up to five years. Microsoft's fine is the largest imposed by the European Commision for either abuse of a dominant position or participation in a cartel. The biggest antitrust punishment until now was a 462 million euro fine imposed against Roche Holding of Switzerland in November 2001, for its role in a series of vitamin cartels. 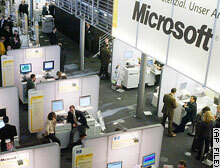 Microsoft was found guilty of monopolistic behavior in a U.S. antitrust case, but settled in 2001 with the Bush administration. A U.S. appeals court is considering whether that landmark deal was adequate to restore competition. The complaint against Microsoft centered on the Microsoft Media Player, which plays music and video clips. It is a free add-on to Windows. Microsoft, based in Redmond, Washington, says this feature benefits consumers, but competitors like Real Network's player and Apple's Quicktime say it threatens their business and they want it unbundled. At stake is Microsoft's market share in the rapidly growing home entertainment market. EU's Monti: "Decision restores the conditions for fair competition"
At the moment, no one company is dominant and Microsoft is facing stiff competition in this arena, but the EU is concerned about the software giant's control of this market in the future. "Sony is coming at it from the Playstation side. They see the Playstation as being the way to be the central of home entertainment. Microsoft sees it's going to be the personal computer. Some of the mobile phone companies see future generations of mobile technology as being the way it's going to come," says Bryan Glick, from Computing newspaper. Analysts say by forcing Microsoft to offer a version of Windows XP without Media Player, consumers could pay higher costs. "If it were to be obliged to offer versions both with and without Media Player, then that would mean we would probably have double the number of consumer PC configuration in our shops. Of course this is product that is built before it is sold," says Brian Gammage from computer consultancy Gartner. These complaints against Microsoft are based on five-year-old technology, which is a lifetime in the technology world. Microsoft's next version of Windows is expected to include a Web search engine that would challenge Google and Yahoo. The EU is already looking into charges from Microsoft competitors that its latest desktop operating system, Windows XP, is designed to help extend Microsoft's dominance into new markets such as instant messaging and mobile phones. For its part, Microsoft has accused the EU of going too far in seeking a record fine for alleged antitrust abuses, saying it is being penalized for behavior permitted in the United States and did not realize it was acting illegally in Europe. Its rivals say though that the U.S. ruling in 2001 did not change the company's abusive behavior.